Since April 5, many immigration lawyers in the Greater New York area have been receiving phone calls from panicked Chinese students. Hundreds of them all asked the same question: I fell into a trap. Now what should I do? Victims of scams normally seek help from the police first. Not these students. The trap they stepped into was set by none other than law enforcement. They were students of the University of Northern New Jersey, which - according to its website - provides "high quality American education to students from around the world." The website has been taken down. And it turns out the school did not exist. It was a phony marketing operation set up by the Department of Homeland Security to catch visa fraudsters. The sting operation led to the arrest of 21 brokers who helped foreign students obtain visas in a "pay to stay" scheme, US authorities announced on April 5. And more than 1,000 students who registered at the school may see their visas revoked and even face deportation. Most of those who are involved, from the brokers to the students, are from China and India. Law authorities often set up traps to lure targets. Still, rarely does an operation go as far as this with a fake entity established and so many people fooled. It was aimed squarely at a long-standing practice; dodgy agencies who offer to help foreigners to get their student visas extended without going back to the classroom. Indeed, with the applications to get H1B working visas more and more competitive, the schemes have become more and more popular. 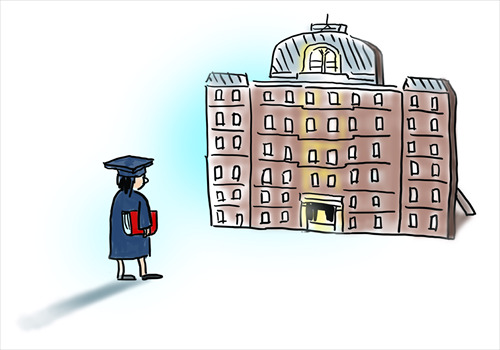 H1B visas allow foreign students to work in this country after graduation. Congress decides on the number of these visas that can be granted on an annual basis. At present the cap is kept at 65,000, plus 20,000 additional visas for those who have masters or higher degrees. The cap has not changed in the past decade. But at the same time, the number of international students in the US has more than doubled to 975,000. "The number one reason students want to study abroad is to improve their career prospects, which could be trying to work here so when they go back they get better opportunities. But there is a big bottleneck because of the visa policy," said Rahul Choudaha, CEO of DrEducation, a New Jersey-based education consulting company. The gap has created a desperate situation for the students. In every year since 2013, the annual cap was reached within a week after it opened for application on April 1. This year is no exception, with the total number of applicants estimated to be 250,000. When this happens, the fates of all applicants will be decided via a lottery process. The odds of winning are about one in three. Through the years, big companies, especially the high-tech industries that rely on foreign workers to fill vacancies have been trying to persuade Congress to raise the cap. Nothing has happened. What has been growing are ploys aimed at beating the system. For example, some big corporations file multiple applications for the same employee in the name of different affiliations so that their chances of winning the lottery rise. Some applicants ask different employers to file applications for them at the same time. While these are all legitimate tactics, they reduce the opportunities for those who file a single application, who are often employees of small businesses or companies with less financial means. But these are only tricks one can use to play the game. When you are kicked out of the game by the ruthless lottery process, going back to school is almost the only option left for those who want to stay in the US legally so that they can get a second chance the next year. Mind you, these are people who've already gotten their degrees from formal universities and, therefore, have little interest in paying big tuition fees to go back there. The fake University of Northern New Jersey, as well as many other actual schools, such as language schools or trade schools, charge much smaller tuition than universities and offer curriculums suitable for those who don't want to study seriously. They are straws clutched at by drowning men. The students of the phony university, if they knew what they were doing, might have done something wrong. That's the reason they fell into the trap. But they are not the only ones who are trapped. All international students, to some extent, are potential prey. They are prey for the universities charging high tuition rates, they are prey for the informal college sector which doesn't care much about their education, and they are prey now for the authorities, in what lawyers are arguing is blatant entrapment. And they call this living the American dream?